At Funslurp, we pride ourselves on curating an ever-growing collection of the wackiest unique gifts for fun-seekers of every age. Our crew works around the clock to find and create the best gags and gadgets to fit any occasion. Our mission is to make gift-giving a hilarious experience for everyone involved. You’ll always have an awesome time choosing cool presents for everyone from your marvelous mama to that random dude you drew in the office gift exchange. Look around, and you’ll find loads of laugh-worthy goodies you’ll actually be excited to give. 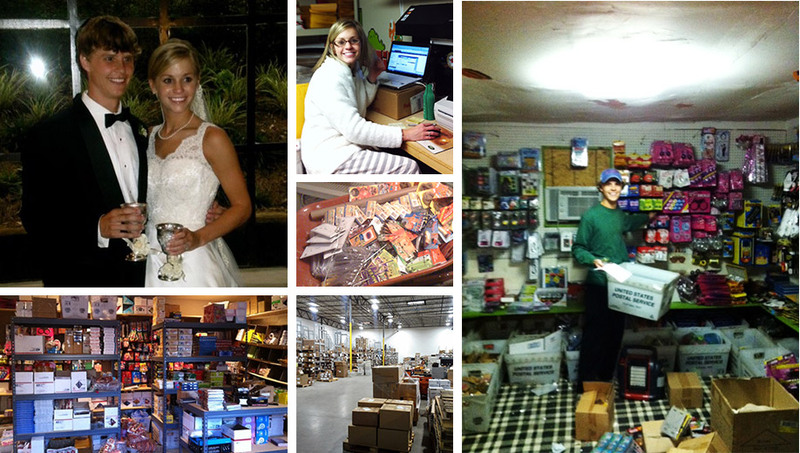 I opened my first online business in June of 1998, when I was in 7th grade. I still remember when the check arrived for my very first sale. My parents nearly fainted! They were absolutely shocked their 13-year-old son was receiving orders over the Internet. FunSlurp started in my college dorm room at Ole Miss. Instead of PlayStation, I was busy coding my newest venture. I’d always loved pranks and jokes, and college only increased my appetite for them, so I fell into the niche naturally. No matter how big Fun Slurp may grow, I’ll never forget that 10 x 20 dorm room I shared with a roommate and my original inventory. I’d refer to it as my “office” during business calls. "Can you hold one sec while I get back to my office?" After freshmen year, my business and I moved to the Frat house on campus. My closet was twice as big there which allowed me to add more products! From there, I shared a three bedroom apartment with a childhood best friend. The deal was that he got the master bedroom if I got the other two. I didn't know what I was going to do with all of that extra space – for about 10 seconds anyway. The next big move was to my own apartment. It wasn’t long before I basically turned it into a warehouse with a bed. College night life often called, but Wednesdays and Thursdays were always reserved for filling orders. (Don't worry they all ship in 24 hours now!) My girlfriend Mary would cook frozen pizza, and we’d work together to get the job done. It was genuinely a fun time! After graduation, the real world was calling my name. I settled into a nine to five in Memphis and was running the website on the side. Doing both drained me, so I decided to stick with the job that made more money. After a brief stint in the corporate world, it was time to pursue my dream full time. I was now 100% self-employed! Scary! Every waking hour was devoted to my business. The wedding came and went, and soon I had my first semi employee – Mary! During the day, she taught kindergarten and loved it! Then, when she came home, she jumped right into adding products to the website. At the time, we were running the business out of our one-car garage, and true to form, we eventually ran out of room – again. So, about a year later, we packed up wheelbarrows full of inventory and moved directly across the street to a house with a much bigger garage. I remember how empty the new garage felt, even with all of our merchandise in it. I really thought we would never run out of space again. I was wrong. After two years, business was booming and I couldn't handle all the work on my own, so Mary left her teaching job and came to work with me. I remember people warning me that it was a horrible idea for anyone to work with their spouse fulltime. They were wrong. We honestly wouldn't be where we are right now if it weren't for Mary. She had fresh ideas, offered support, and grew our product line in ways that I wasn't capable of on my own. We had an absolute blast in the "office." We practically lived out there! We filled every order and answered every email ourselves. We worked our fingers to the bone day in and day out and would do anything to entertain ourselves. We ate pizza, drank wine, played the music loud, and competed to see who could fill more orders in an hour. Whenever I think about those days I can’t help but smile! When we inevitably ran out of space again, we built an addition on our house and managed to fill it to the max within a month! It was finally time to bite the bullet and move to the state of the art warehouse we are currently in today. I really don't think we will be filling this up anytime soon – but I've said that before! Our business isn’t the only thing that’s grown over the years. Over the last few years the FunSlurp family has done some growing too! Mary and I have welcomed two special editions, Ashford and Jones! I really can’t think of a happier time in our lives. Mary is an outstanding mom, and this has been the most awesome of adventures for both of us! We sincerely appreciate your business and can’t wait to see what the future brings!